This article argues for the expanded application of information-theoretical measures, such as entropy and normalized mutual information, for research of biomarkers of aging and physiological age as an early predictive measure of age-related multimorbidity and frailty. 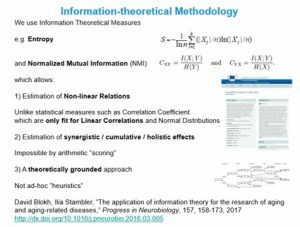 The use of information theory enables unique methodological advantages for the study of aging processes, as it allows the researchers to evaluate non-linear relations between biological parameters, showing the precise quantitative strength of those relations, both for individual and multiple parameters, demonstrating cumulative or holistic (synergistic) effects. The diagnostic models can be built based on diagnostic parameters routinely available to physicians (frailty indexes, laboratory analysis, physical evaluations) as well as more advanced biomarkers (e.g. genetic and epigenetic analysis) – in relation with age and age-related diseases and frailty. The diagnostic systems that are built in this way can be open and can include any number of additional parameters correlated with age and age-related diseases. Of special importance, early evaluation of physiological age may facilitate the early diagnosis of cancer with a prolonged preclinical period. This may considerably improve the efficacy of treatment for oncological diseases. There have been debates regarding the usefulness or lack thereof of mammography for subjects aged 40-49, that is regarding the possibility of preclinical diagnosis.3 It may be difficult to solve this problem in the framework of pure oncology, disregarding the factors of age or aging, but only in the framework of aging research, for which information-theoretical analysis can be meaningfully applied. Also for neurodegenerative diseases, such as Alzheimer’s disease, the vast plasticity of the brain of the aged and the feasibility of positive therapeutic interventions, or even cures, have been recognized. Yet, it has also been recognized that, in order to accomplish such interventions, the earliest possible detection and the consideration of polygenic etiologies will be necessary.7 Here too information-theoretical statistics, capable of utilizing time series methods for prediction from an earlier, preclinical age, and employing mutual information measures to establish non-linear diagnostic correlations of multiple disease determinants, including age, can be indispensable. Generally, the ability to reliably quantitatively diagnose “delayed aging” or “healthy aging” may pinpoint powerful factors facilitating healthy and productive longevity. Here “healthy aging” (or “healthy longevity”) may be understood as the absence of age-related frailty, as commonly defined in geriatric medicine, that is, an active and functional state of older adults characterized by a decreased risk for future poor clinical outcomes, diminished development of disability, dementia, falls, hospitalization, institutionalization or decreased mortality.9 The ability to provide early quantitative evaluation of frailty risks is also of great medical and economic significance. The humanitarian and economic importance of early detection of aging-related diseases is obvious. Early detection makes it possible to apply preventive medical interventions when the disease is in a more manageable and even curable state, ideally even before any clinical manifestations, thus significantly postponing the time it may take for the disease to progress to a severe, debilitating and more costly state. This postponement of morbidity is also the reason for the vast economic benefits of early detection, necessary for the early preventive intervention. As shown for the US, patients with chronic age-related diseases expend in their last year of life about one third of the total Medicare expenditures (~$15,000 per person).10 Any postponement of this high morbidity period thanks to early detection and preventive interventions can produce massive net health and economic benefits. Thus the healthcare benefits of even minor improvement in the ability of early diagnosis, necessary for early preventive treatments of aging-related diseases, could be immense. The economic benefits from the preventive approach, intervening in the aging processes underlying the non-communicable diseases before they take clinical forms, would be immense as well (hundreds of billions of dollars savings in health expenditures in the course of several decades just in the US, according to some models19). Yet, to accomplish this, improved diagnostic capabilities are needed for the aging process itself, capable to reliably estimate the person’s physiological and biological age and the effects of interventions on that age. Currently, the effects of various treatments on human health are often examined in a disconnected manner, without knowing the precise interactions of various treatments. The information-theoretical measures of correlation (such as normalized mutual information) can be employed to test the effects of single or combinations of various treatment factors (such as drugs, genes and lifestyle factors) on the health span and the disease status. By the precise quantitative evaluation of the influence of such factors on the health span and disease status, both synergistic positive and antagonistic adverse effects of treatment interactions can be determined. The current systems lack the formal ability to select the most informative (and hence clinically useful) parameters. Using information-theoretical methods, the most informative single parameters or groups of parameters with the highest influence on the health span and disease status can be selected. The selection of the most informative parameters, such as those that contain information about other selected parameters, will allow for a more economic, convenient and efficient diagnostic system. This can save time and expenditures on unnecessary testing, by eliminating the less informative parameters from the outset. These capabilities are based on the known abilities of information theory, such as 1) to estimate non-linear relations; 2) to describe diverse systems in common terms of entropy change; 3) to estimate the degree of similarity or difference between various systems; 4) to examine combined effects of different parameters on a parameter of choice; 5) to select the most informative parameters; 6) to predict outcomes, as was shown by the wide use of information theory in diagnosis, especially of age related diseases,1 including cancer;23 7) to estimate the general system stability;22 8) to estimate changes in system stability, heterogeneity, regulation and information loss in response to external stimuli. A critical requirement for building an information-theoretical diagnostic model of physiological age and aging-related diseases is the availability of a large range of clinical and biological data on a large population sample. The data can be as diverse as possible, any data may be of interest. The more data are available and the more diverse they are, the more interesting correlations may be discovered and the better may be the diagnostic power. The data may include biomarkers of aging and the types of data that are commonly used in quantified health applications. For example, cellular, molecular and biochemical markers for biological age may include: age-related changes in telomere length (telomere measurement), advanced glycation endproducts (AGE), 8-hydroxyguanine in DNA and amino acids with oxidized side chains as biomarkers of oxidative stress, levels of proteins that are essential for critical functions, DNA repair capacity, decrease in one or more stem cell populations, T-lymphocyte subsets, gene expression micro-array analysis (e.g. for such genes as Sirtuins, Foxo, Clotho, etc. ), epigenetic markers (e.g. methylation), measures of oxidative-reductive and acid-base balance, and more. Furthermore, functional markers for aging may include: muscle strength (manual muscle-testing; dynamometer: hand-grip strength), vascular rarefaction and dysfunction (capillaroscopy; forearm blood flow techniques), gait speed, step-to-step variability, balance, functional mobility (timed-up-and-go), endurance capacity (VO2 max), cardio-respiratory indicators (PaO2; PaO2/FiO2), EEG/ECG/EMG, nutritional state/intake, cognition (tests), psychological type profiling (tests), social participation, socio-economic status (income, employment). Diverse therapeutic influences may be factored into the model in order to evaluate the efficacy of potential aging and lifespan improving interventions and their effects on the biological, physiological and functional age.24 Those interventions may include: pharmacological treatments (specific drugs, such as rapamycin, metformin, statins, aspirin, etc. ), regenerative cell therapies, specific biomedical interventions (operations, physiotherapeutic techniques), reduction of risk factors (smoking, alcohol consumption), dietary factors (e.g. supplements, nutrients, functional foods), physical activity, exercise, rest and sleep, education. Thus, thanks to the diversity of modeled parameters, various factors affecting aging – biological, environmental and social – can be inter-related and integrated. Of course, the costs of particular markers is an important consideration, hence it may become preferable, at least for practical applications, to use such parameters that would be routinely and inexpensively available to practicing physicians. Notably, however, the number of parameters and the amounts of data, collected, analyzed and made available to physicians and researchers, are constantly and rapidly increasing. Another issue in selecting data to construct a diagnostic model for physiological age and aging-related ill health is the fact that there is currently no clear, formal and universally accepted clinical definition of aging that can serve as the basis for diagnosis and therapy, which can formally and reliably distinguish between “pathological/accelerated aging” as opposed to “healthy aging.” Not surprisingly, the World Health Organization’s “Global Strategy and Action Plan on Ageing and Health” (2015) includes “Strategic objective 5” – “Improving measurement, monitoring and research on Healthy Ageing” with such priority tasks as “Develop norms, metrics and new analytical approaches to describe and monitor Healthy Ageing” and “Develop resources, including standardized survey modules, data and biomarker collection instruments and analysis programs.”25 Such a formal understanding and measurement of healthy aging can be aided thanks to the use of standard information-theoretical measures. The set of medical histories of people who died in 1990-1995, at the age of 65-75 years, from various aging-related diseases, such as type 2 diabetes, cancer, heart disease and Alzheimer’s disease. For the solution of each of these problems, out of the two subsets, it may be possible to select further subdivisions corresponding to the particular diagnostic tasks at hand. Such a two-fold sample set may also allow the researchers to quantitatively and formally investigate the process of aging, as an underlying and common factor of these diseases, by utilizing a multi-factorial model which corresponds to the understanding of aging as a complex process depending on multiple factors of different etiology. In other words, rather than attempting to infer from the poorly defined concept of biological aging toward its derivative conditions (diseases), it may be possible to formally define pathological or early aging from these diagnosable conditions, seeking common age-related denominators between them. It should be noted that information-theoretical models of physiological age and aging-related ill health do not need to restrict themselves from the outset to any particular kinds of parameter data or hypothesis. The information-theoretical approach may allow the researchers to utilize any kind of data, at any level, into a single diagnostic model. Thus it can, for example, combine diverse biochemical, molecular-biological, cellular, tissue, physiological, functional and other parameters related to aging. Thus the more parameters of different kinds the researchers may be able to obtain, and the larger the investigated sample they will be able to obtain – the stronger and more informative the model will be. Yet, for practical concerns, and at the initial stages, it may be preferable to strive to first utilize the parameters commonly used in the clinic, such as blood work (biochemistry and cytology). It should also be noted that the choice of the 2 subsets, as indicated above, is not restrictive either. The two subsets allow the convenient primary distinction between subjects presumably characterized by different levels of resilience in aging. Yet, with the addition of more age cohorts, including the young (e.g. across several decades of life) – the diagnostic capabilities may be improved, depending on the availability of data. Even though the information-theoretical approach can incorporate any number of subjects into the model, improving its diagnostic capabilities, at the initial stage it may be desirable to analyze data from at least 2000 subjects, say 1000 from each subset, as this number of subjects is a putative desirable requirement to establish combined diagnostic indicators from 3 or 4 different parameters. The following rule of thumb can be applied for the selection of the sample size: In the analysis of tables of conjunction, we assume that for almost all the cells, the expected number of elements should be no less than 5 in each cell.26 We consider discrete parameters that can assume 3 values (i.e. below, equal or above some normative of delimiting value). The rule of thumb, to fulfill the sufficiency criteria for the estimation of the sample size, is: the number of cells in the conjunction matrix (say 9 for 2 parameters – 3×3) x 5 (5 elements in each cell) x 5 (to increase the probability that there will be 5 elements in each cell, though this latter number can be more). Thus for a correlation between 2 single parameters, it is 9x5x5=225 (~200-250), for a correlation of 2 parameters with a third one: 27x5x5=675 (~500-700), for a correlation of 3 combined parameters with a fourth one: 81x5x5=2025 (~2000), etc. 2000 subjects is also the typical number involved in FDA phase 3 clinical trials.27 However, with further increasing the sample size, the diagnostic value will be further increased. The sample sizes will also depend on the nature of the relations examined. For example, when the parameters are strongly mechanistically related, the sample size could be less. And once again, costs of analysis need to be considered, obviously increasing with a greater sample size. Using information-theoretical methodology, it may be possible to establish diagnostic decision rules not just for individual diseases,22 or for physiological age,28 but also for combined age-related diseases (age-related multimorbidity). Out of several individual disease variables, a single “multimorbidity” variable can be established composed of several diseases (e.g. diabetes and heart disease and dementia, etc.). And this new composite variable can be correlated to individual or combined risk factors by normalized mutual information. Based on the values of normalized mutual information (strength of correlations), the decision rule could be constructed for the entire multimorbidity variable, or for different types of multimorbidities. Knowing chronological and physiological age is necessary for diagnosis. It is necessary to accomplish early diagnosis also for individual diseases. The degenerative aging process is the main contributor to age-related diseases. Hence, not being able to evaluate it, discards one of the main, most informative diagnostic parameters. Moreover, the corresponding inability to intervene into degenerative aging, discards one of the most promising therapeutic targets. There is a need for an integrative, time-related approach. Evaluation of only single diagnostic parameters and risk factors, or only single diseases, without their connection to each other and to the patients’ age, without considering their dynamic changes in time, their long-term and synergistic effects, can produce misleading results in diagnosis, and ineffective and even unsafe therapy. The various diagnostic parameters, including age and period, should be evaluated together and intervened together. Evidence-based criteria for physiological age and multimorbidity are needed to develop new therapies and interventions. Furthermore, establishing quantitative and holistic criteria for healthy aging/longevity can help validate the new treatments. The currently existing therapies and interventions are not always effective. There is a critical need to advance novel biomedical research of aging and aging-related diseases, to develop and test new treatments, to improve the healthspan of the elderly. The development of diagnostic criteria for healthy longevity (healthspan), like physiological age or multimorbidity, can help gauge the effects of new treatments and interventions. Hakan Jonsson, Lars-Gunnar Larsson, Per Lenner, “Detection of breast cancer with mammography in the first screening round in relation to expected incidence in different age groups,” Acta Oncologica, 42, 22-29, 2003. JudithMeadows, Jacqueline Suk Danik, Michelle A. Albert, “Primary prevention of ischemic heart disease,” in Elliott M. Antman (Ed. ), Cardiovascular Therapeutics: A Companion to Braunwald’s Heart Disease, Third edition, Saunders Elsevier, Philadelphia PA,2007, pp. 178-220. David Blokh, Ilia Stambler, “Estimation of heterogeneity in diagnostic parameters of age-related diseases,” Aging and Disease, 5, 218-225, 2014, http://www.aginganddisease.org/EN/10.14336/AD.2014.0500218; Diane Chau, Steven V. Edelman, “Clinical management of diabetes in the elderly,” Clinical Diabetes, 19, 172-175, 2001. Linda P. Fried, Jeremy Walston, “Frailty and failure to thrive,” in William R. Hazzard, John P. Blass, Walter H. Ettinger, Jeffrey B. Halter, Joseph G. Ouslander (Eds. ), Principles of Geriatric Medicine and Gerontology, 4th Ed., McGraw Hill, New York, 1999, pp. 1387-1402. National Committee for Quality Assurance, Executive Summary. The State of Health Care Quality 2004, National Committee for Quality, Washington DC, 2005, quoted in C-Change: Collaborating to Conquer Cancer, Making the Business Case: How Engaging Employees in Preventive Care Can Reduce Healthcare Costs, 2008, http://c-changetogether.org/Websites/cchange/images/Risk_Reduction/C-Change_Business_Case_White_Paper_(1).pdf. David E. Bloom, et al., The Global Economic Burden of Non-Communicable Diseases: A report by the World Economic Forum and the Harvard School of Public Health, World Economic Forum, Geneva, 2011, http://www3.weforum.org/docs/WEF_Harvard_HE_GlobalEconomicBurdenNonCommunicableDiseases_2011.pdf. Dana P. Goldman, “The economic promise of delayed aging,” in Stuart Jay Olshansky, George M. Martin, James L. Kirkland (Eds. ), Aging: The Longevity Dividend, Cold Spring Harbor Laboratory Press, 2016. David Blokh, Ilia Stambler, “The application of information theory for the research of aging and aging-related diseases,” Progress in Neurobiology, 157, 158-173, 2017, doi: http://dx.doi.org/10.1016/j.pneurobio.2016.03.005; http://www.sciencedirect.com/science/article/pii/S0301008215300599. David Blokh, “Information-theory analysis of cell characteristics in breast cancer patients,” International Journal on Bioinformatics & Biosciences (IJBB), 3(1), 2013. US Food and Drug Administration, “The Drug Development Process. Step 3: Clinical Research,” accessed June 2017, http://www.fda.gov/ForPatients/Approvals/Drugs/ucm405622.htm.